Day #1 Sneak Peek of Taylored Expressions May Release. Welcome to day #1 of Taylored Expressions May Release Sneak Peek. I may sound like a broken record, but it is true. Every month Taylored Expressions have amazing release. So many wonderful stamp sets and dies again this month. You are in for a treat. I am show casing two new stamp sets today. The first one is a background stamp called Dizzy Dots Background stamp. I did get a bit dizzy after stamping the background due to my astigmatism.lol! Have said that I really love this background stamp. Great for masculine cards. 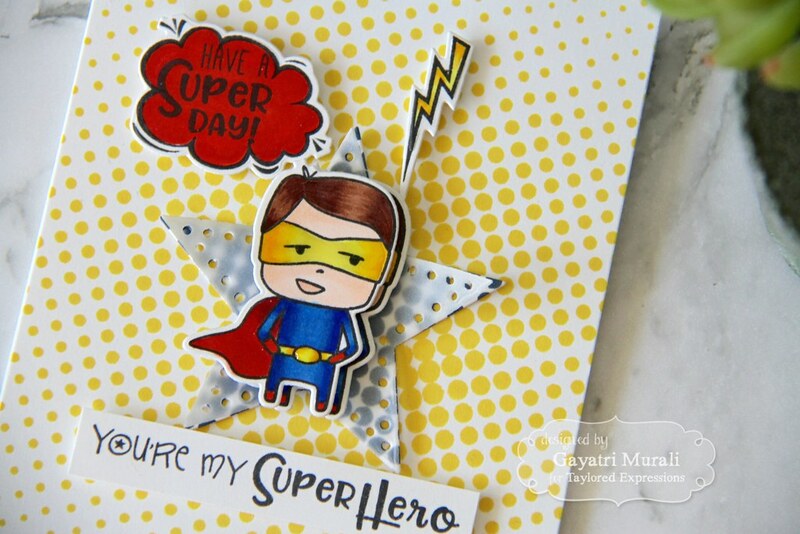 I combined this background stamp with the new My Super Hero stamp and die combo to make my card. I stamped the background using Dizzy Dots background stamp using TE Lemon Meringue dye ink. I used MISTI to get a good impression of the dizzy dots. I also stamped a scrap piece of white cardstock using Blue Corn TE dye ink. 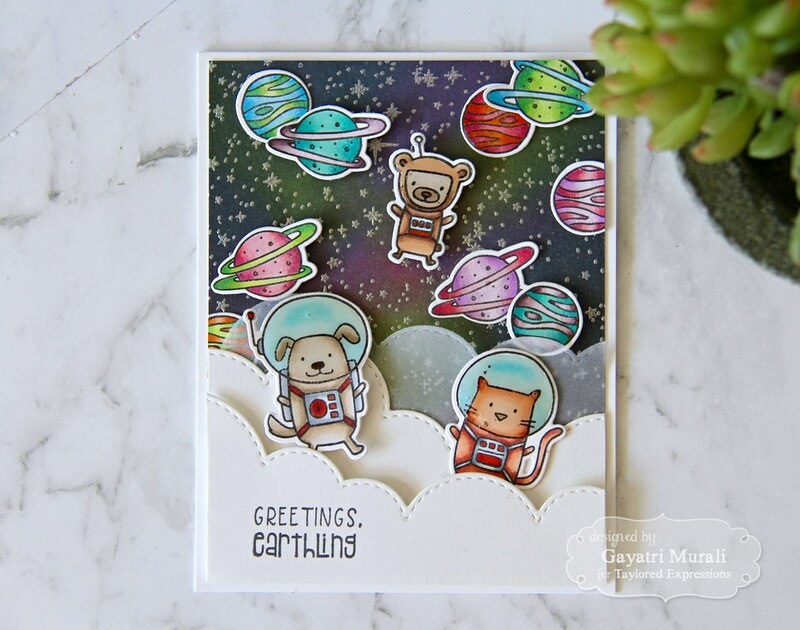 I die cut this card stock using the second die from the new Pinhole Star die. I used the same die to die cut a vellum paper. I layered and glue them both with the vellum on top. 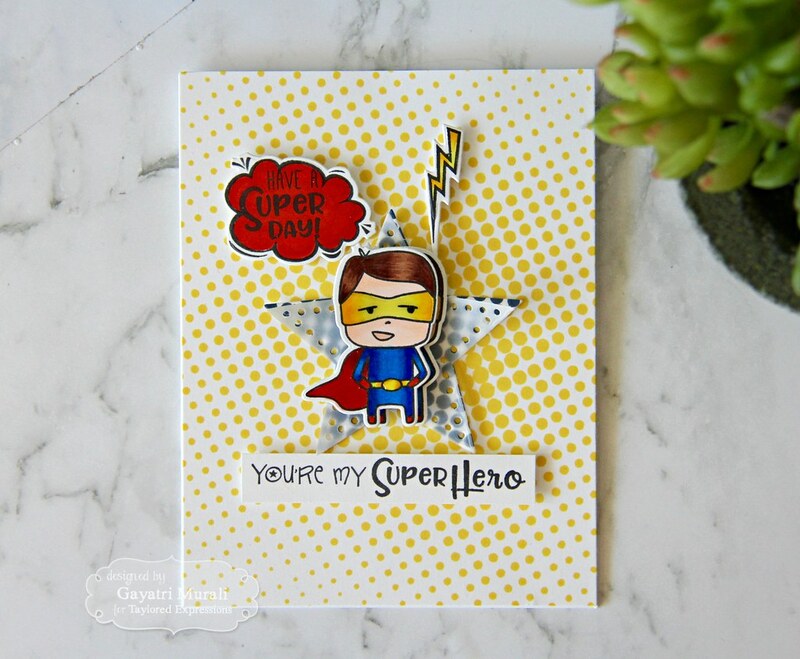 For the focal point I used the new My Super Hero Stamp and die combo as well as Pow!Wow!Boom! stamp set and dies. I stamped the images and copic coloured them. Then used the coordinating die to die cut the images. I simply adhered them using foam adhesives. 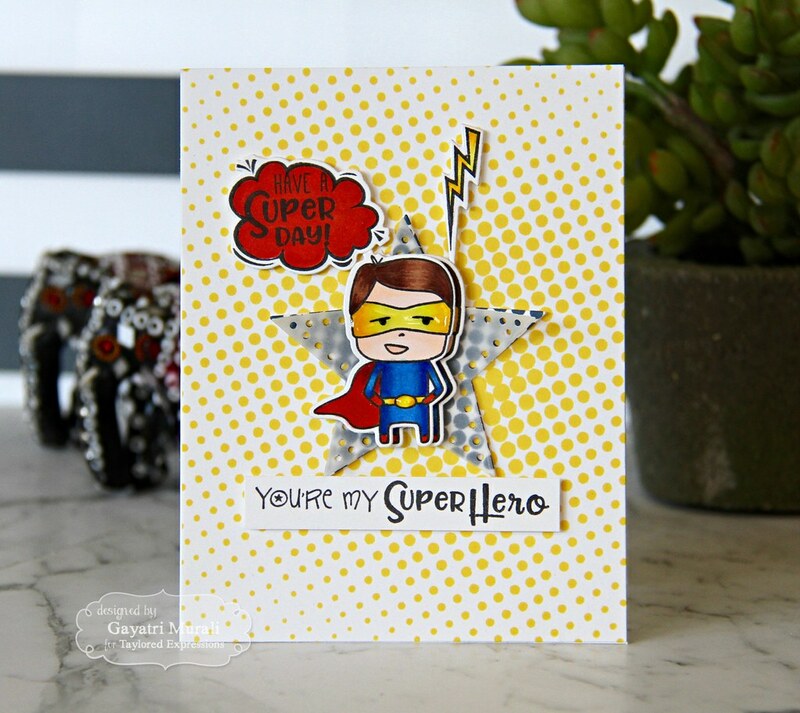 The superhero image is stamped twice, coloured and die cut. I slightly off set and adhered one image over the other using foam adhesives. The sentiment is simple stamped on a white strip of cardstock and adhered. I added glossy accent to the belt and the glasses of the superhero image. Here are all the supplies I used to make my card. 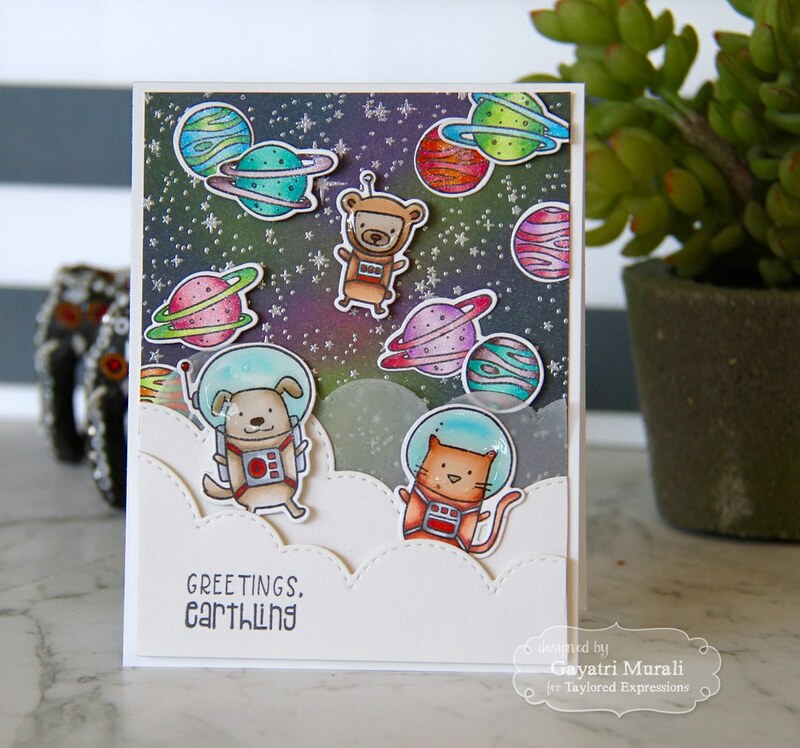 The second stamp set I am showcasing today is called Space Cadet. This stamp set also has coordinating dies. 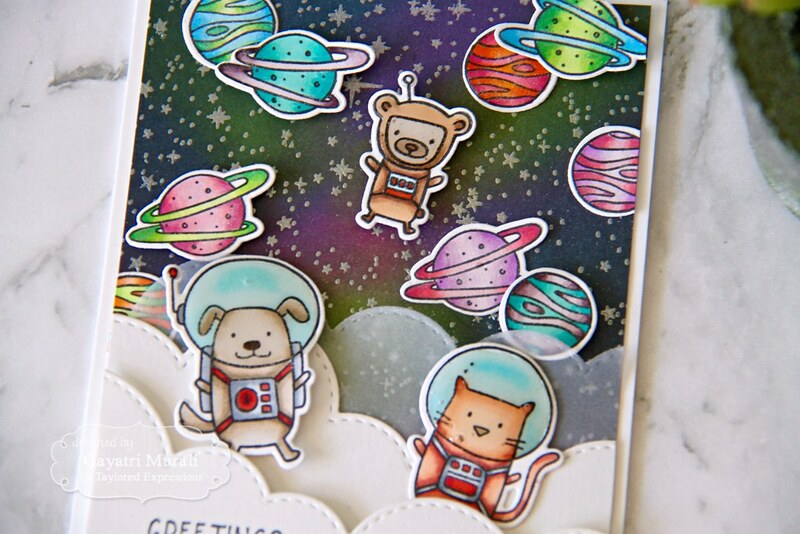 The space themed stamp set is very trendy at the moment in the card making world especially with galaxy technique for the background. That is what I have done on my card. I stamped all the images and some more than once on white cardstock and copic coloured them all. That is what I normally do. I just stamp all the images I need to colour from a particular release all at once using MISTI on white cardstock. And colour them all watching TV. Then I used the coordinating dies to die cut them all out. For the galaxy background, I used TE dye inks in Blue Corn, Oreo, Lemon Meringue and Lollipop. I sponged them on white card stock panel after silver embossing the new Twinkle Twinkle background stamp. The clouds are die cut using Build A Scene Rolling Clouds die using Sugar Cube card stock and Vellum paper. I layered the clouds with the vellum and one of the white clouds flush with glue and the third white cloud using foam adhesive. The layered clouds are adhered on the galaxy background panel. 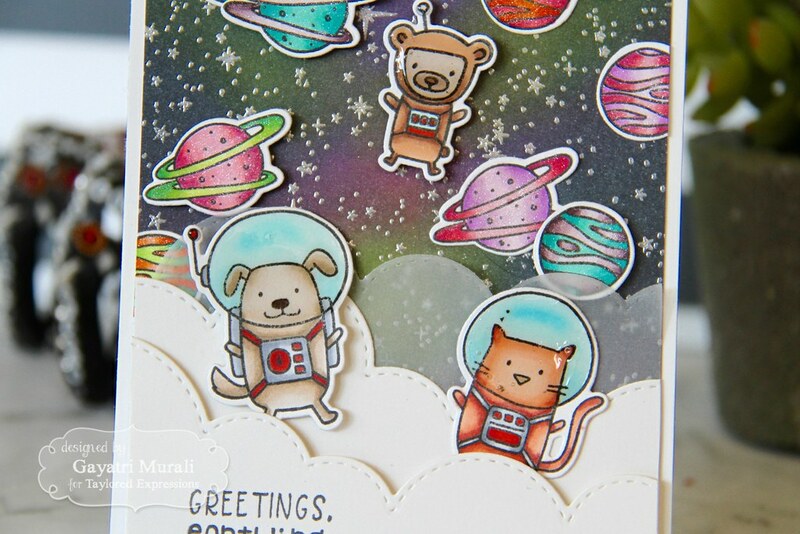 The I adhered the coloured die cut images from Space Cadet stamp set as shown. Best part was I forgot to stamp the sentiment on the clouds panel. So I used mini MISTI to stamp the greetings and black heat embossed the sentiment. Here are all the products I used to make my card. Thanks for stopping by today. I will see you tomorrow with day #2 sneak peek. Great use of that dotty background! I never would have thought that stamp could look so amazing! Great cards! Rainy here. We must be going to get tons of May flowers when it stops. Send some rain here. It has been dry for past 35 days. :) Thanks for your lovely comment BunnyD.